of you? All of you. the salt of our tears. to know you are missed. In Canada, over the years, many women and girls have gone missing, some of whom have been murdered, their bodies recovered, many more for whom there have been no answers, no closure. 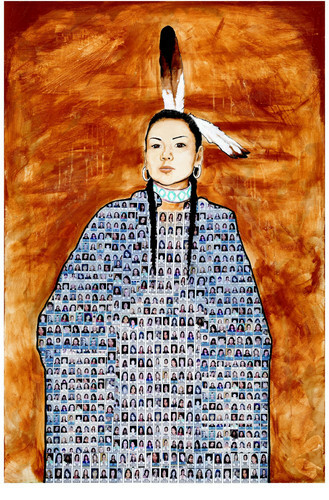 Among the estimated 4,000 Missing and Murdered Women, 60 to 70% have been aboriginal. (This estimate of the missing comes from the Canadian Minister for the Status of Women in 2016.) Many, (around 40 young women), have gone missing along the Highway of Tears in the north. 49 women from Vancouver's Lower East Side were murdered by one man. In 2016, a national inquiry was begun, independent of all government, to look into the missing and murdered women. It has been fraught with difficulties. Jan is a member of the Clayoquot Writers' Group in Tofino. She has been writing since she was in her teens, encouraged by her English teachers. 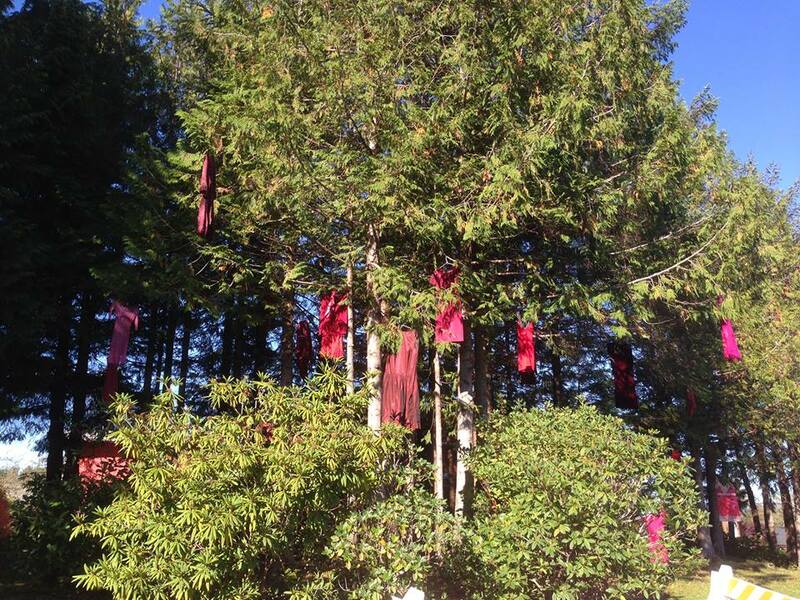 In 2015, Jan created an arresting work of art to honour the missing women, as part of Tofino's participation in the REDress Project. Jan explains, "It seemed like there was just too much red tape. 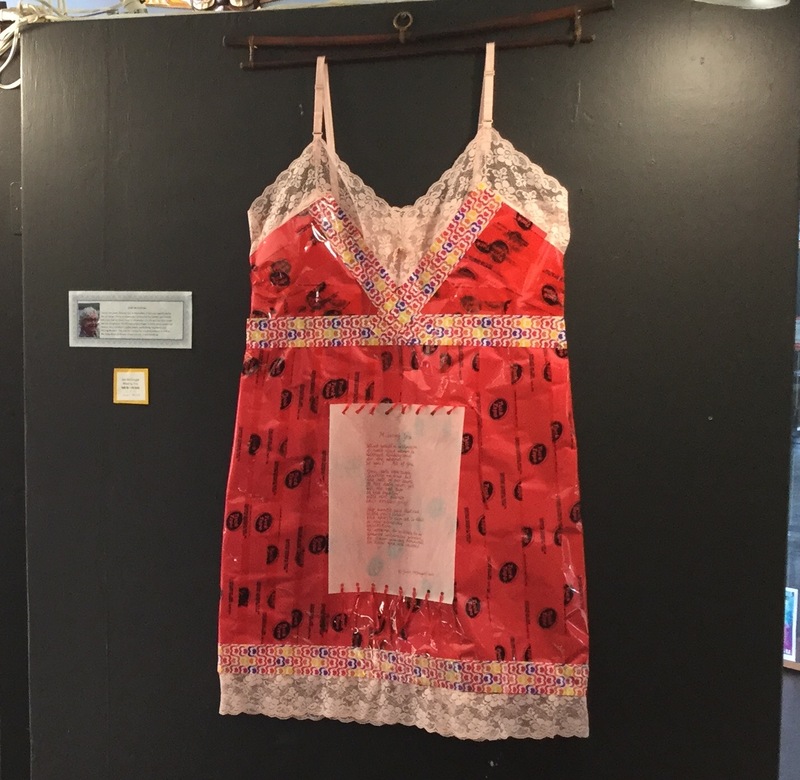 It occurred to me to create a dress with red tape, as a statement piece, for our local installation at the Village Green in Tofino. I had in mind to use red tape that said: 'Fragile, Handle with Care', as I imagined the Post Office might have some for sale. However, I had to use the only kind of red tape I could find in my small town. I applied the tape to a lacy vintage slip. 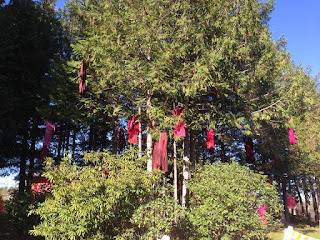 We hung about twenty dresses in the trees by the village green. It was autumn. It was haunting." The result is in the video above. Two years later, the Pacific Rim Arts Society put out a call for submissions to their 2017 Cultural Heritage Festival Show. The theme was "Celebrating Women of the West Coast". Jan explains, "I wanted to submit a poem to the art show and was considering the challenge of entering a literary piece into a show traditionally displaying visual arts. Magically, I came up with the idea to honour the women who were absent, the missing women. I mounted the poem on the same dress of red tape. My piece was accepted into the art show, held at the Black Rock Resort in September 2017." It made, and makes, a very moving statement, wherever it is displayed. As I am wont to do, I asked Jan what she loves about poetry. "I love the surprise that writing poetry reveals to me," she replied. "I love the challenge of conveying emotion and illustration in a very tight and sparse piece without revealing too much, allowing the reader to participate in the deciphering. I especially love crafting the poem for the desired pattern, rhythm and sounds I want to orchestrate. I take pleasure in reading and puzzling the craft, mystery and surprise in other poets' poetry." Jan also presents small nuggets of poetry in her unique Poetry Stones. They are favourites of mine, and I have several of them. Jan combines her love of finding beauty in nature with communicating compassion, creating original verses which she writes by hand on smooth stones from local beaches. On her poetry stones, Jan writes about energy, mindfulness, gratitude, and the ocean, sending the stones out to transfer energy all over the world. Jan's poetry has been published in two local anthologies, Salt In Our Blood and Crowlogue, as well as in the We'Moon Date Book and the Sound magazine in Tofino. Her essay, So, When Are You Moving Back?, is in the anthology: Writing the West Coast. 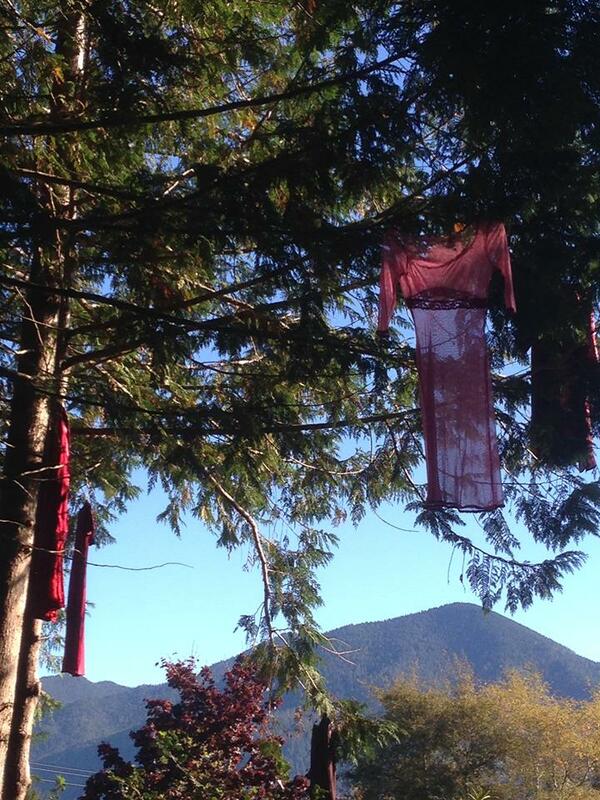 The dresses in the trees are haunting! The poem, a love poem. Sherry this was beautiful....it is a world-wide tragedy all the missing and murdered women. Here I have been reading about the many Native women who are missing and yet we never hear about it let alone really do anything. Those poetry stones are a wonderful idea! What a very moving and inspiring project – and poet! And oh, how I love the poetry stones! It gives a new dimension to the idea of 'small stones' (small pieces of observation which some of us try to write from time to time) – even if Jan has never heard of that concept. Wow, this is quite a feature, Sherry. 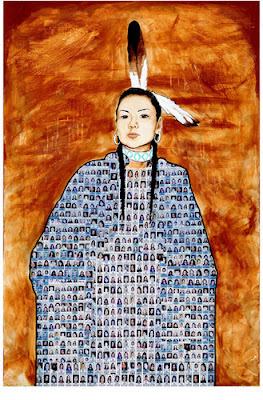 4000 missing and murdered women! I hope the national inquiry continues and more of the perpetrators are brought to justice. Janis McDougal's poem was VERY moving! I love the poetry stones, and appreciate the comparison to the Small Stones we sometimes write online. Mary, women continue to go missing. So much heartbreak, in so many families, so many unanswered questions. Which is why those red dresses in the trees are so haunting. This was so interesting for me and was the first time I'd read anything about the murders, missing women and the red dresses, which are so effective, as are the poetry stones. What a moving and impactful share, Sherry. The artwork and poem ~ haunting ~ I am, literally sitting here with a lump in my throat. The scope of this national tragedy is profound. It is heartrending. For the families of the missing woman, it must be hell … not knowing. I commend Janis McDougall - and, indeed, everyone involved in making this project happen. Everything that can be done to focus attention on finding answers and putting an end to these atrocities - should be done. I was not aware of the missing, mostly indigenous, women of Canada. I live near the Mexico border near Juarez, Mexico, where women have been missing and murdered in extreme numbers. How crazy this world can be. How ungrateful for feminine energy. Thank you for posting this article Sherry. It is sad but I appreciate knowing that there are those who honor our dead sisters. I am grateful to them. Yes, women are suffering hard lives and deaths world-wide. Yet I believe our best hope for the world lies in the rise of feminine energy and action. May we Rise everywhere and gentle this world into healing. This is so heartbreaking and haunting! Love the way poet's voice rises against this. How strange that atrocities have to be done against women! That too against indigenous women of Canada!